So what's threatening these heroes? Pretty much everything you can think of and some new stuff to boot. Sure, this game has vampires, werewolves and ghosts, just like every other horror title, and they're about as you'd expect, with some differences. The haunting Entities, for instance, don't just clank chains and warn misers of the error of their ways. They build their own bodies out of car parts, possess objects as well as people, and make full use of all the usual poltergeist and haunting phenomena. Vampires, for another example, aren't just pointy-fanged pests; they get their ultimate power from other dimensions of reality, a dimension which the characters can - potentially - visit. That's not counting the beasties that are unique to BtS, like the magic hunting Demon Spider, the ultra-violent insectoid Malingous, scarlet hunter Naracant, techno-terror Gremlins, or the scheming Sowki. There are some pretty interesting adversaries here, and even when the entity's basically a new take on an old foe, the twists are fun enough that your players will have a challenging time working out how to defeat them. This is not a subtle game. The core assumption is that any supernatural problem can be solved with overwhelming force, applied at the right time; there's no suggestion of mystery here, no clue-finding mechanic. All your enemies are Evil by default, and destroying them is really the only option. Interestingly, there's no suggestion of any supernatural Good in the game universe, or any kind of higher power. The characters are very much on their own. 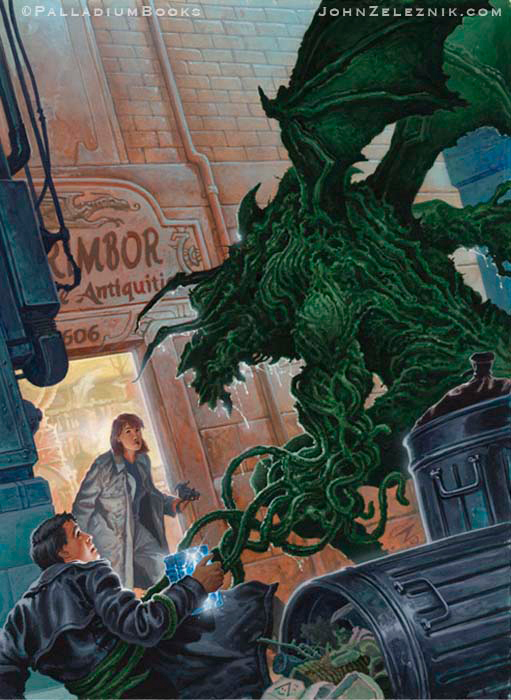 The scenarios reflect this: when your heroes aren't blasting flying monsters that have invaded a government lab, they're chasing demons in the sewers, or fighting tentacle monsters from another dimension that have invaded a long-dead scientist's house. The exception in the main book is the Teeny-Bopper Terror, or Tomb of Perpetually Cool Adolescents, an ... interesting one-shot for Victim characters that depends on not having stats or using any of the combat mechanics. It feels oddly out of place, as if the author didn't get the memo and thought he was writing comedy scripts. Internally the book's clean and well laid out, with some incredibly evocative black & white art from Steven Bissette of Swamp Thing fame, and Kevin Long, who worked on pretty much everything Palladium ever published. Long's OK, but Bissette is much, much better, which makes the difference in art style a little jarring. This is the pre-photoshop era, so clever imaging tricks are out of the question; it's pencil art or nothing, fanboy. Those of us hungry for more had to wait two long, frustrating years before the game's only published supplement: Boxed Nightmares, with six scenarios, new rules for creating secret supernatural-busting organizations, a meagre three new monsters, and some GM tips. The supplemental rules and GM tips are useful, but brief, which is to be expected, as the main interest here is the scenarios. No Teeny-Boppers, thankfully, just action, action, and more action. There isn't much room for Victims in these scenarios; you'll be going up against magic-powered gangbangers, demonic cocaine smugglers, possessed psychopaths, psychic assassins, Tasmanian Devils, and Jack the Ripper's long lost evil twin. The scenarios are fun but brief, and lack a lot of the structure you may have come to expect from other systems. There often isn't a beginning, clue-finding middle, and end; instead the adversaries are described, the reason why the players might want to tangle with them given, and after that, it's up to the GM what happens next. Internally the layout is clean and well-presented, with black & white art, most of which is by Long. Again, Long's OK, but his work is functional rather than evocative. It lacks any real 'spook' factor; just heavily-armed heroes going after slavering bad guys. Is Beyond the Supernatural worth seeking out? That depends. Do you enjoy horror films like Salem's Lot, Firestarter or A Nightmare on Elm Street? Have you always wanted to play a game that felt like Delano's Hellblazer? Beyond the Supernatural isn't a perfect fit; it's old-fashioned, a little clunky in places, and if you're not comfortable designing your own scenarios this really isn't for you. That said, it is a complete action horror game in one book - Boxed Nightmares is nice, but not a must-have - so if you're bored with cosmic horrors, and just want to shoot ghouls in the face with a shotgun, this is worthy of your time.